The N-FAB RSP Front Bumper is built for extreme off-road demands. The N-FAB RSP Front Bumper comes with a skid plate* for the ultimate in underbody protection. 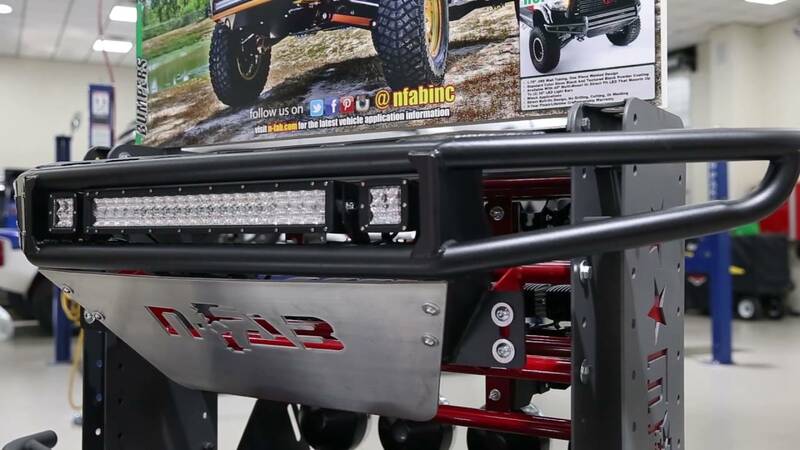 The N-FAB RSP Front Bumper offers the capability to mount conventional lights or LED light bars. Some models of the RSP Front Bumper come available in a "Winch Ready" model. The N-FAB RSP Front Bumper is a one piece design constructed from .120" wall tubing for strength and durability. The RSP Front Bumper comes in both gloss black finish and textured black powder coat finish. Winch options available for certain makes and models - Includes Anti-theft hardware for LED bars. N-FAB RSP Front bumper installs at home by following the installation instructions. There is no cutting or drilling needed. Simply bolt on to existing bumper mounts. The product comes with easy to understand vehicle specific installation instructions.